In the depths of winter when the trees are bare, the cars have turned the snow into horrible, gray slush and the chances of seeing the sun feel like they are a million to one, injecting a bit of color into your life can become a top priority if your spirits are not going to be allowed to sink. Typically though, when the winter months arrive, people tend to opt for colors which are as dark and bleak as the weather, so that the streets are filled with glum-looking individuals wearing dreary grays and browns and somber black. Even the thick woolen fabrics from which their clothes are made seem to weigh them down physically, mentally and spiritually. 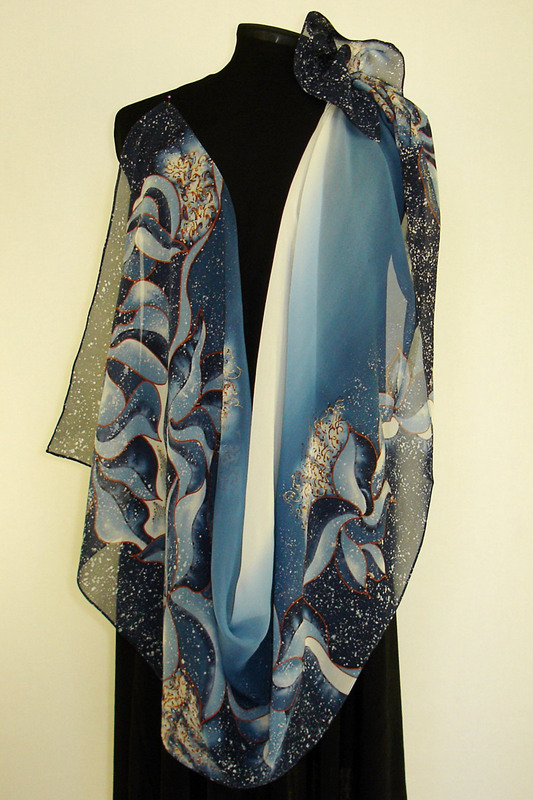 Winter is one of the best times of the year to invest in a fabulous hand painted silk scarf or hand-dyed silk shawl. The glorious colors cannot fail to lift dampened spirits and the exquisite beauty of these wonderful accessories will make you feel pampered and special at a time of year when everything seems to have fallen into decay. 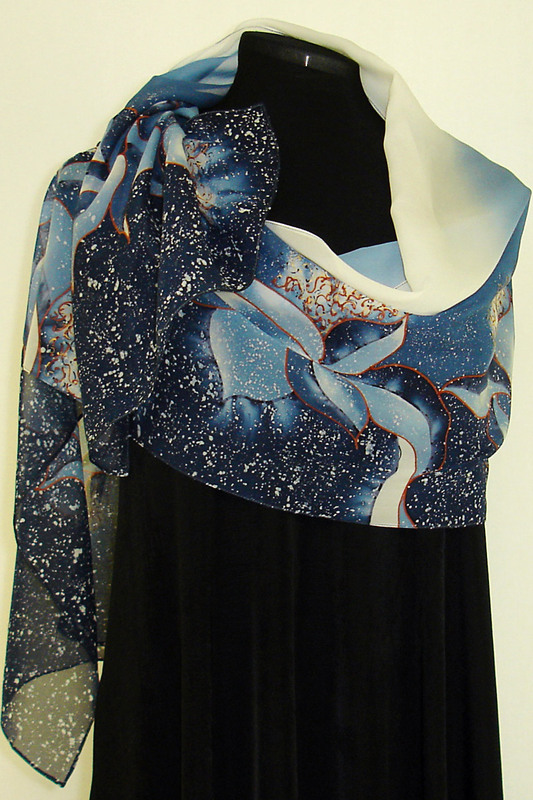 Women’s silk scarves and shawls which use flowers in their design work particularly well in terms of lifting the clouds, as these provide a timely reminder that spring is just around the corner. With so many to choose from, go for something with vibrant colors to make your heart soar and wear it indoors and out to keep you feeling invigorated. Of course, as well as being intensely beautiful, silk scarves and shawls are incredibly practical during the winter months too. Despite its soft, floaty appearance, silk is one of the warmest fabrics there is, so whether you choose to wear a scarf around your neck, or a scarf or shawl across your shoulders for added warmth, you will always feel cozy however cold it gets outside. The weight of silk is another important factor in winter too. When we are bundled up in layers and layers of clothing, our figures simply disappear, making us feel fat and unattractive, which of course only adds to our sense of misery. Wearing something as fine, light and yet warm as silk does away with the need for thick, heavy articles of clothing and lets you recapture the lightness of spring and summer. The dark cold winter months are usually the time when we women like to console ourselves with chocolate and treats to make us feel better about the cold and the rain outside. In doing so, however, all we do is pile on the pounds and end up feeling worse. Treating yourself to a luxury handmade silk scarf or shawl, on the other hand, can have the effect of making you feel truly pampered without the calories and, of course, you will have a very beautiful and highly versatile accessory to show for your money. Don’t let winter get you down, but instead treat yourself to a bit of luxury and wear your brightly-colored silk scarf or shawl everywhere!